Carefully add eggs and boil for 6 minutes for soft boiled. For hard boiled, boil closer to 9 minutes. Remove from hot water and immediately place in ice water bath. While water is heating up and eggs are cooking, you can prep the tofu. Cut tofu into bite-sized cubes. Drizzle with 2 tablespoons of soy sauce and sesame oil; gently toss to combine. Spread tofu cubes onto a greased baking sheet. Bake tofu for 35-40 minutes until golden. Heat olive oil in a large soup pot over medium-high heat. Add onion and cook until softened and translucent, about 5-7 minutes. Add mushrooms and cook until they have softened, about 5-7 minutes. Add ginger and garlic; cook one more minute. Add in rice wine vinegar, miso paste, remaining 2 tablespoons soy sauce and broth. Bring to a boil. Add ramen noodles and cook according to package directions, usually between 5-10 minutes. For the last 2 minutes, add bok choy and green onions. Ladle soup into bowls. 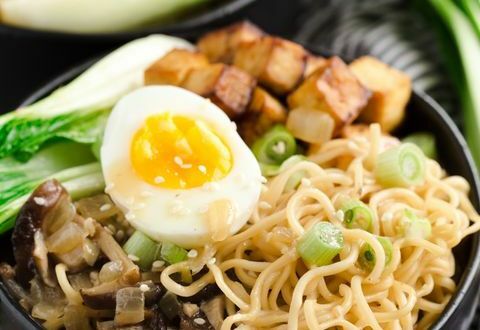 Top with soft boiled eggs, sesame seeds and as much Sriracha as you can handle!